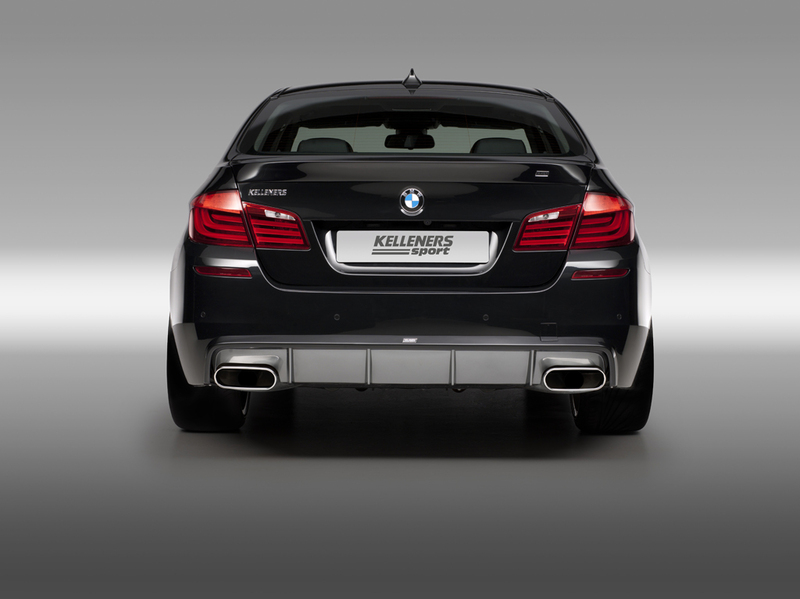 German tuner Kelleners releases their own version of the BMW 5 Series with the M Sport Package. The stylish upgrade includes upgraded performance and handling, more aggressive look, and an upgrade to the interior. In the performance area, Kelleners Sport engineers give their 5er a 20 percent power increase for both petrol and diesel models. The 520d, for instance, now reaches 218 hp, instead of the standard 184 hp, and maximum torque reaches 450 instead of 380 Newton metres. The performance of the 535i jumps from 306 hp to 367 hp with maximum torque increasing from 400 to 480 Newton metres. The exhaust tips are being redesigned as well, with a more oval shape and slightly wider. The sport springs lower the vehicle by around 30 millimeters, increasing handling while cornering. For full details on the package, see the press release below. 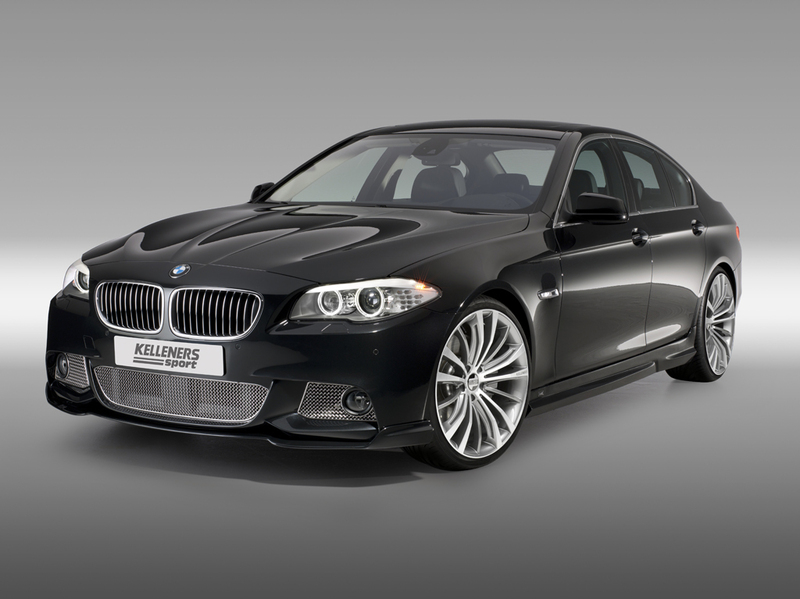 Kelleners Sport brings new dynamics to the BMW 5 series with M sports package. The comprehensive aerodynamics package, enhanced performance, optimised suspension and stylish upgrade of the interior transform the already sporty-looking saloon into a really racy vehicle. Kelleners Sport engineers have unleashed around 20 per cent more engine power for petrol and diesel models. The 520d, for instance, now reaches 218 hp (160 kW), instead of the standard 184 hp (135kW), and maximum torque reaches 450 instead of 380 Newton metres. The performance of the 535i jumps from 306 hp (225 kW) to 367 hp (270 kW) with maximum torque increasing from 400 to 480 Newton metres. The 5 series with M sports package demonstrates this increase in power together with Kellener Sport’s elegant aerodynamics package. The electropolished stainless steel mesh of the MS three-part front grille emphasises the sporty origins of the BMW specialists. The dynamic design starts at the MS front spoiler lip, moves onto the side mouldings and grabs attention at the end with the rear spoiler, Kelleners lettering and MS rear apron with integrated diffuser. The oval stainless steel exhaust pipes measuring 225 x 90 millimetres add a sporty edge both left and right. The sport springs set from Kelleners Sport is instrumental in the improved handling of corners. This lowers the vehicle by around 30 millimetres, therefore reducing roll and pitch movements. Kelleners Sport alloy wheels are also an important element of the new release. With dimensions of 9×20 inch at the front and 10×20 inch at the rear, they are fitted with high quality tyres in sizes 255/35 and 285/30. The BMW expert offers the “Hamburg” design in polished silver graphite, polished platinum silver and matt black. The “Berlin” alloy wheel is available in polished platinum silver, polished matt black and matt black. Specially selected features also enhance the interior of the car. These include pedals and footrests made of polished aluminium as well as a set of real velour black floor mats carrying the tuner’s logo at the front. The high quality interior trim made of midnight black leather with white stitching adds to the feeling of elegance. 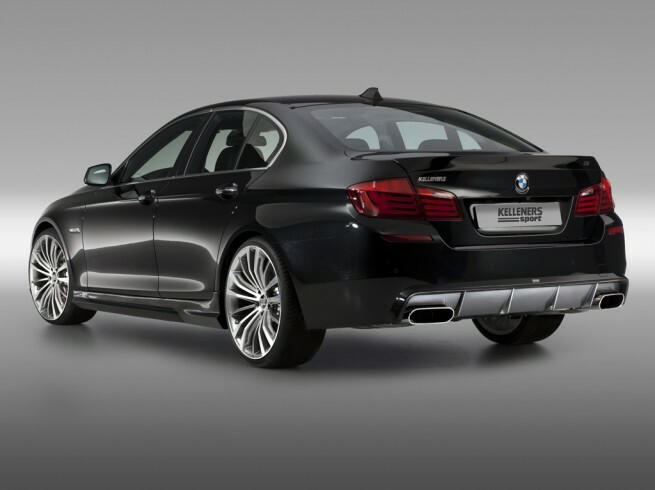 With this comprehensive package, Kelleners Sport enhances both the dynamics and the individuality of the BMW 5 series with M sports package.